Peter Gallway "Yes Yes Yes"
With distinctive vocals and his own unique blend of soulful urban folk-pop, Peter Gallway is simply unmistakable. Often cited for his production work (Cliff Eberhardt, Cormac McCarthy, Devonsquare), Gallway brings his own work to the forefront with this standout collection of songs. As a performer, Peter's recordings date back to Ohio Knox and the Fifth Avenue Band in the '70s and early '80s. He followed those albums with solo projects in the mid-'80s and '90s, including the critically acclaimed Gadfly release "Small Good Thing" (1994). 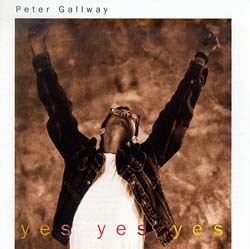 With "Yes Yes Yes" Peter continues to take us places we all know, but seldom take the time to reflect upon.